How’s your bulk liquid transportation solution? Are you in search of a new way of shipping your liquid food products? If so, say no more, because Kan-Haul has all the answers for your bulk liquid transportation needs. Kan-Haul specializes in liquid food products transportation nationwide and globally. For more than 30 years as a food grade transportation company, Kan-Haul is also a leader in logistics, making consistent timely deliveries, combined with the strictest safety and food handling measures. Over the years, we have continued to refine our bulk liquid transport process through the latest technologies. 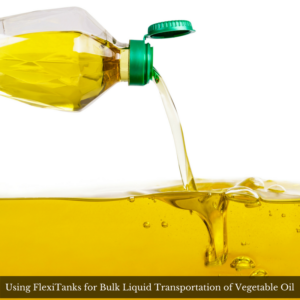 When it comes to the handling and transportation of bulk liquids such as wine, juices and vegetable oils, using FlexiTanks is the most efficient method. So it should come as no surprise that we use FlexiTanks to ship our customer’s bulk liquids. Let’s take a look at the benefits of using FlexiTanks for bulk liquid care and transportation. One of the factors that makes Kan-Haul an industry leader in shipping, is the usage of FlexiTanks. FlexiTanks are bags specifically designed for the transportation of bulk liquids. Typically, they are bag or bladder-shaped and just one single FlexiTank can hold between 4,210 and 6,315 gallons of liquid, the equivalent of 25 tons (50,000 lbs.). FlexiTanks can also fit in standard 20-foot ocean freight containers. It is constructed of many different layers, each layer containing a pump and valve, making it waterproof and airproof. Because FlexiTanks are single-use, they are non-contaminable, fully disposable and/or can be recycled once the bulk liquid transport reaches its destination. Having already EU certification, FlexiTanks started early testing in Europe, than began to grow exponentially in Russia. According to Grand View Research, over a million FlexiTanks units around the world are expected to be in full utilization by 2022. Certain liquids are great for FlexiTank transportation. These liquids include: juices or juice concentrates, additives, all various types of syrups, sweeteners, wines, edible oils, agricultural oils, animal oils, vegetable oils, mechanical/technical oils and food additions. The quality of these type of liquids remain in tact when utilizing FlexiTank shipping. Safe and secured packaging – With several layers that each contain pumps and valves that seal off air and water, FlexiTanks are waterproof and airproof. This ensures that bulk liquids are safely transported, and uncontaminated. FlexiTanks are very spacious – With just one liquid bulk transport, FlexiTanks can hold up to 25 tons of liquids, making them very efficient and cost effective in transportation. Flexible and convenient for storage – FlexiTank shipping can be easily delivered by truck, car or sea. FlexiTank Efficiency – FlexiTanks can transport 31% more liquids than standard liquid containers, mainly due to its one time single usage. Trouble free/No hassles attached to FlexiTanks – Because of the design of a FlexiTank bag, there’s no necessary or additional hassles such as cleaning products or processes involved. One single FlexiTank transportation usage and the bag is fully disposable. Much faster loading and unloading times when using FlexiTanks – FlexiTanks are so much more convenient and efficient when compared to traditional IBC totes or drums, that its loading and unloading times have proven to be much lower than the average bulk liquid transportation methods. More options for shipping and packaging – With FlexiTanks, customers now have more options to package and distribute. FlexiTanks allow customers to ship bulk liquids with little to no packaging required. Highly cost effective- FlexiTanks are far less expensive than traditional bulk liquid containers. When you use a FlexiTank you spend three times less than if you were to use traditional bulk liquid transportation. All(meaning multiple liquids) bulk liquids can be safely transported at once, without the need of additional storage, as the actual FlexiTank bag is considered a storage unit in itself.